On March 2, 2000, Maine Governor Angus King unveiled a new program “From Lunchboxes to Laptops,” officially known as the Maine Learning Technology Initiative. Starting in 2002 and then every year into the indefinite future, the state would provide each of Maine’s 16,000 seventh-graders with a portable computer, plus free Internet access, that the student would keep and use through high school graduation. The governor was prepared for such criticism. King pointed to the fact that over the past two years the Legislature has put $43 million into a fund to pay for school-building renovations and repairs. Lawmakers have proposed adding $20 million or more this year. It was important for King to leave a legacy, but he was particularly interested in that legacy being forward-facing – crucial for a state whose economy is seasonal and that has seen some of its traditional, resource-based industries (timber, commercial fishing) falter. "I want Maine to have the most digitally literate society on earth," said King. To pay for the project, King initially proposed taking $50 million of state funds and raising another $15 million from private and federal sources in order to create a $65 million “permanent endowment fund.” That initial $50 million would come from a state budget surplus for the 1999 fiscal year projected to be around $100 million. As Bob Johnstone writes in Never Mind the Laptops, King wanted to do something “big” with that money. "I found it frustrating that most of what we do around here is incremental, at-the-margins stuff," [King] explained. "You get a little more money, you put a little more money into fixing roofs; you fix a few more roads, you do a hundred miles of roads instead of 88 miles. We decided that this was a kind of once-in-a-lifetime chance to do something transformational instead of incremental." But the state’s projected economic windfall was short-lived, and while the legislature did eventually back King’s idea, the program was trimmed back rather severely from $65 to $15 million. Rather than a permanent fund, the laptop initiative would be dependent on annual re-appropriation. We know that computer technology in schools – learning technology – done the right way can provide these tremendous boosts to teaching and learning. Hundreds of individual schools nationally and internationally have piloted “anytime, anywhere” learning technology, putting portable computers in the hands of students. Results are universally positive. Mistakes have been made, and those we can learn from. Others have tinkered, but Maine can be first: first to recognize, as a State, the enormous potential of learning technology; and first to act boldly to prepare our schools and students to meet this challenging change. There are a couple of phrases there – “anytime, anywhere” “learning technology,” – that suggest that one of the key members of that task force, Blue Hill, Maine resident (and former MIT professor) Seymour Papert, had helped to shape the report. It’s hard to imagine that, with Papert on the task force, the recommendation could have been anything but to go ahead with the program. 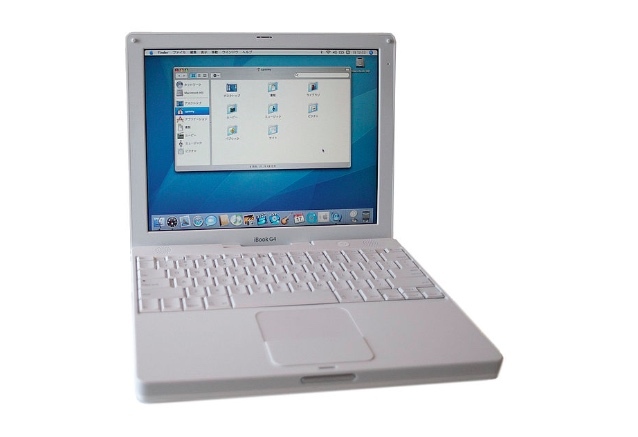 Papert was by many accounts responsible for giving King the idea for a one-to-one laptop program in the first place. Unlike Governor LePage’s notion that students should use Windows computers because workers use Windows computers, Papert has always seen the computer as “the intellectual tool of our time” – a machine that prompts learners to think about thinking. “It’s unconscionable if we don’t give this to teachers and students,” Papert told The Ellsworth American in 2000. 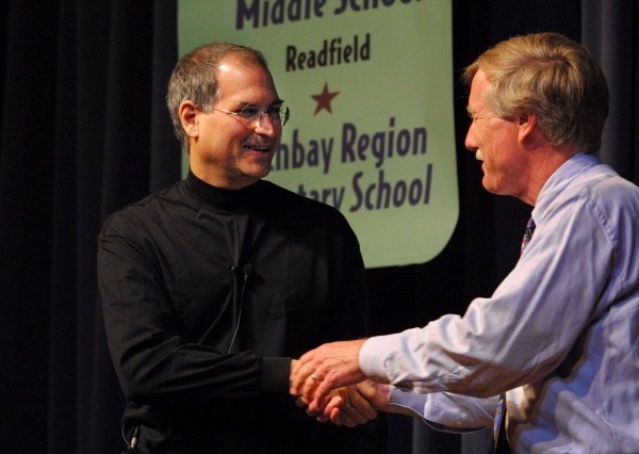 In 2002, the program had its official rollout, and some 17,000 iBooks were distributed to seventh-graders and their teachers across Maine’s 239 middle schools. The following year, another 17,000 laptops went to the new cohort of seventh-graders. At each school, a teacher lead and a tech lead were identified to help support the devices’ integration. (Many point to the professional development component to Maine’s program ia one of the main reasons for its success.) In 2009, the program was expanded so that students, once reaching high school, received new devices. In 2012, on the tenth anniversary of the program’s implementation, the Hechinger Report noted that “statewide evidence of how laptops affect achievement is scarce.” But test scores are just one way to look at the impact that Governor King’s proposal has had on the state. One of the key goals of the Maine Learning Technology Initiative has always been equity, and providing each public school student from grade 7 onward a laptop (and for a time, free Internet access at home) was certainly a massive step in that direction.